It’s back-to-school season, which means yellow buses are back on the roads. According to the National Highway Traffic Safety Administration, school buses are 23 times safer than passenger cars and 10 times safer than walking. Stay 10 giant steps away from the outside of the bus at all times. If you stand too close, the bus driver can’t see you. Wait for OK to Cross. Wait until your bus driver gives you the OK sign before crossing the street. Heavy backpacks and wet shoes are no match for the handrail. 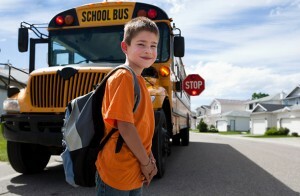 Hold on tight when getting on and off the bus to keep from tripping or slipping. Once you sit down, keep both feet flat on the floor and your back against the seat. Be Still Until the Bus Completely Stops. It’s fun to be first, but it’s more important to be patient. Wait for the bus to completely stop before you try to get on board. And always stay in your seat while the bus is moving. See the full post from First Student for more tips for parents, drivers and first time riders.